Hello friends, the most waited smart phone from yu yuphoria has launched today. the registration started today 12th may. We know that all smartphone lovers are waited for today to know the full specifications and price of yu yuphoria. here techintor.com we are posting all details of micromax yu yuphoria smartphone includes yu yuphoria full specifications, actual price, how to register for yuphoria. So those who are interested in yu phoria, must read this yu yuphoria detailed article. click on the above link, and you will redirect to amazon page and click on the register button. The falsh sale is on June 11 th 2015 at 2 PM. 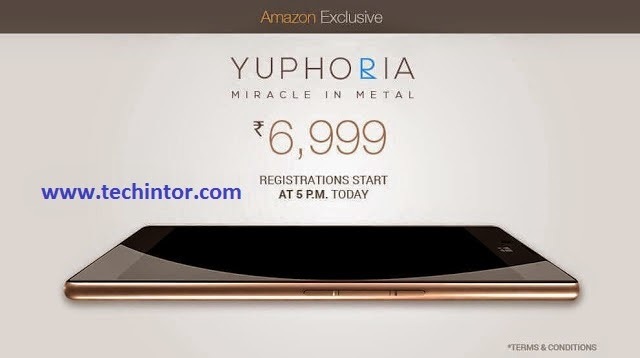 I hope that you are succesfully added micromax yu yuphoria into your cart. Display: 5.0 Inch, 1280 x 720 HD Display, and with Gorilla Glass. Processor: 1.2 GHz, 64 Bit. Storage: 16 GB ROM, 2GB RAM. Camera: 8 MP Rear Camera and 5 MP Front with LED Flash. Saturn Ring in Around Camera. This smartphones looks cool. Micromax yu yureka is still the best under 10,000 range. What's about yu yuphoria. Is it better than yureka.